What wind turbine brand do you want to trade? 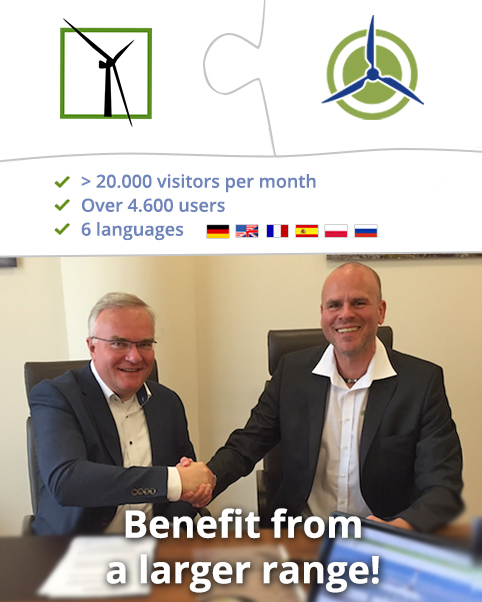 In May 2016, wind-turbine.com acquired windturbines-marketplace.com. From now an, you are a user of the world’s largest online marketplace for used wind turbines and benefit from a whole range of advantages! All relevant marketplace processes are will take place mainly on wind-turbine.com. You can log in with your user data as usal and place your search and sales advertisements for free and without limitation. More than 4,600 users from over 200 countries around the world are awaiting you as well as, depending on the selected rate, many new functions and features for even better business opportunities! Your wind turbine advertisements on windturbines-marketplace.com remain visible, so serves as an additional distribution channel. The maintenance of both your advertisements and your user profile will take place only via wind-turbine.com from now on. Please note that in the rate model Free, your contact data is masked on both portals. Your search and sales advertisements remain generally free of charge and without any limitation. We finance ourselves through mediation of qualified leads (pay per lead) and our new, attractive rate model.